Remember that moment in your childhood when you heard and recognized that sound was the ice cream truck coming? Well, we are living in that moment with a little help from our friends. 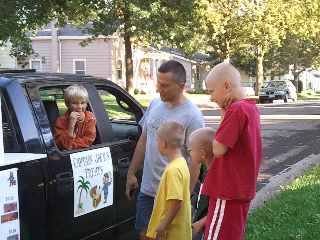 Captain Jacks ice cream treats is making that memory for us each Monday as he brings his ice cream truck down our street. Since his son is one of our Awana Sparks, it makea it evem more sweet. Pun intended. Shouts of " ICE CREAM!" and running feet are going to be remebered long after those calories have been consumed. Thank You Captain Jack for making a sweet childhood memory for my boys.